Earn 4995 loyalty points when you order this item. Mytek Manhattan DAC II is a truly high end, flagship headphone amplifier and DAC with full MQA hardware decoding and the ability to extract the last word in performance from almost any pair of high end headphones. In addition to its hardware credentials and impressive feature list, this model is purist audio at heart. The analogue inputs route signals through a minimal signal path with the state of the art analogue attenuator attached directly to analogue and headphone outputs. 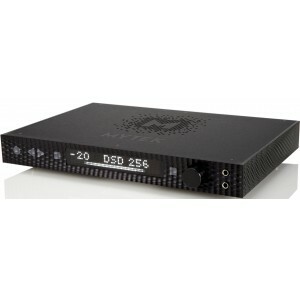 This model also includes the option of a high quality phono card for using it directly with your turntable (making this one of the few truly high-end headphone amplifiers to include this feature, along with an optional Roon ready network card. Mytek's new Femto Clock that's incorporated into the C777 Clocking architecture pushes jitter and the noise floor below measurable levels. Highest Resolution Support for modern high-resolution audio formats including support for PCM 32 bit 384 kHz DXD to Quad DSD256 11.2MHz. RIAA curves and selection of gain can be modified from the menu or via the remote via relay switches. Twin isolated power supplies for the analog and digital stages are incorporated to reduce noise and crosstalk while improving power and consistency. Optional 'Roon Ready' network/wi-fi card turns the Manhattan II into network streamer with 24/192k and DSD64 maximum throughout.